Mary Schindler addresses Michael Schiavo though the media saying, "Please give my child back to me." A brief glimpse at the other woman in Michael Schiavo's life. Jesse Jackson joins the fight to resume feeding Terrri Schiavo. What kind of a person was Terri Schiavo before her collapse? A look at past cases similar to the Schiavo case.  MedPage Today: Does Terri Schiavo feel pain? PINELLAS PARK, Florida (CNN) -- The mother of Terri Schiavo made an impassioned plea to her daughter's husband Tuesday night, calling on him to "give my child back to me." Terri Schiavo's feeding tube was removed the afternoon of March 18 under court order, and doctors have predicted the brain-damaged Florida woman would die in the next few days. Her mother, Mary Schindler, uttered two sentences at a news conference: "Michael and Jodi, you have your own children. Please, please give my child back to me." The mother was addressing Michael Schiavo and the woman he has been living with since the late 1990s -- Jodi Centonze -- with whom he has two children. Late Tuesday, George Felos, the lawyer for Michael Schiavo, issued a written statement saying, "The courts have repeatedly said this case is not about Mrs. Schindler, Mr. Schiavo or any other third party. It's about Mrs. Schiavo and her own wishes not to be kept alive artificially." Michael Schiavo maintains his wife would not want to be kept alive in her condition, which courts have ruled is a persistent vegetative state. Mary Schindler and her husband, Bob, claim she could improve with intense therapy. The parents were surrounded by supporters Tuesday night outside Hospice House Woodside in Pinellas Park, including a woman carrying a sign that read, "Cowardly Jeb!" The Schindlers contend Florida Gov. Jeb Bush could have done more to save their daughter, although he said he has done all he can legally do. Bush pushed to have the state take custody of the woman, but a court turned down the effort. In 2003, the Florida Legislature passed a law allowing the governor to intervene, but the courts overturned it. 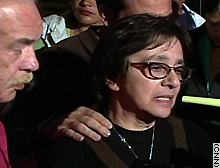 Felos said Tuesday night he visited Terri Schiavo about 6:30 p.m. He said her lips were moisturized and not cracked, her skin tone was "excellent," and she was being cared for by well-trained workers who are fond of her. Felos said she has a stuffed toy animal under her arm and that there are religious pictures in her room, describing the setting as "very calm and peaceful." His description differs from that of the Schindlers, who contend she is suffering and that her condition shows in her dry skin and chapped lips. Bob Schindler said after visiting his daughter that "she's failing" but "doing darn good under the circumstances." Michael Schiavo said his wife suffered from bulimia, an eating disorder, that resulted in a potassium deficiency, triggering the heart failure. She has been in the center of a decade-long legal tug-of-war between her husband and her parents. State courts have ruled in favor of Michael Schiavo, and the Schindlers have apparently exhausted their legal and legislative options. Brother Paul O'Donnell, a family spokesman, said Tuesday he hoped Michael Schiavo had a "change of heart," and save his wife. The Rev. Jesse Jackson, who arrived Tuesday at the hospice, called Terri Schiavo's situation an "injustice," and sought to pressure state lawmakers to pass legislation aimed at keeping her alive. Such a move seemed unlikely. Last week, in a 21-18 vote, the state Senate narrowly defeated a bill that would have prevented doctors from removing a feeding tube from patients who had not expressed their wishes in writing. The House passed legislation 78-37. A Senate source told CNN that even if the body passed a bill aimed at helping Schiavo, the House wouldn't take it up until next Tuesday. Randall Terry, an anti-abortion activist acting as a spokesman for Schiavo's parents, said Jackson gave the Schindlers' effort "new momentum." Jackson traveled to Florida at the invitation of Bobby Schindler, Terri Schiavo's brother. "This is one of the profound moral, ethical issues of our time, the saving of Terri's life," Jackson said. "And today we pray for a miracle." The civil rights leader said he contacted Michael Schiavo to request a visit with her, but "he said he thought no." Jackson said he is "sensitive" to the struggles and pain that both Michael Schiavo and Terri Schiavo's parents and siblings are undergoing. "While law is important, law must be tempered with mercy to have justice," he said. While he has sided with the Schindlers, Jackson said in a statement last week that he had "serious misgivings about the appropriateness of Congress intervening with the legal court process on a specific, individual matter." In his statement, Jackson added, "a consistent moral and ethical position would extend a feeding tube to all who are confronted with starvation -- to demand public, government policy to feed the hungry." Some who support Michael Schiavo's position also gathered outside the hospice Tuesday, calling for Terri Schiavo to be allowed to "die in peace." The case has galvanized national attention and created strange bedfellows by partnering Jackson, often a champion of liberal causes, and Randall Terry, the founder of Operation Rescue. "In my wildest dreams, I could never have pictured this," Terry said. Jackson said he was there because "I feel so passionate about this injustice ... how unnecessary it is to starve her to death." While Jackson was speaking to reporters, an apparent protester slipped past police into the heavily guarded hospice before he was arrested by police. Officers used a stun gun to apprehend the man, who police said was Dow Pursley, a family therapist. Capt. Sanfield Forseth with the Pinellas Park Police Department said the man would be charged with attempted burglary and resisting arrest without violence. Meanwhile, supporters of the Schindlers were in Washington Tuesday for the second day, pushing for officials there to intervene. The Rev. Patrick Mahoney, a conservative Christian activist who has helped spearhead protests for the Schindlers, stood outside the U.S. Supreme Court with a handful of people. When the Schiavo story ends, he said, "The campaign after that final chapter is written is: Never again." CNN's Bob Franken and Rich Phillips contributed to this report.